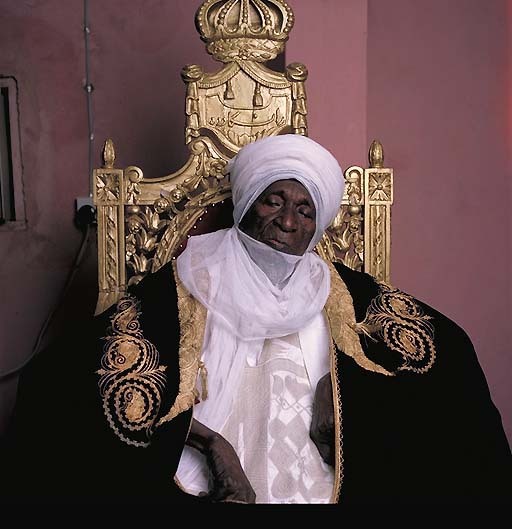 This photo was taken fifteen days before the death of the Sultan of Sokoto. He had reigned for more than fifty years. At the time of his successor’s coronation, who was chosen by a council of “king makers”, a conflict erupted. Two royal families disputed the choice; the consequence: one hundred deaths. According to “news watch”, a large daily Nigerian newspaper, the power of the Sultan of Sokoto is such, that most of the Nigerians questioned would rather be Sultan than President of Nigeria. Abubakar Sidiq was not as rich as other soverains of this country. He earned annually about 1 million naira ($200 000). But with this income, the Sultan had to support his suite of eighty-six people, and feed one hundred and fifty grand children.